Hurry over and snag these GoFloats Giant Pool Floats starting at $26.99 (Reg. $49.99)! 4/4 only or while supplies last. 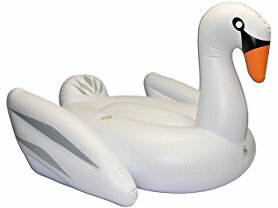 The GoFloats' giant floating swan and unicorn were designed to combine the highest quality materials and the sleekest design while adding functional elements to provide the best overall in-water experience. The raft itself is made from premium raft-grade vinyl that is 25% thicker than other cheap knockoffs. The floats also have grommets on the front and back so you can tether to other rafts or to a fixed point. The raft can be inflated using a premium quick-inflate valve by pump (2 minutes - highly recommended) or by mouth (30 minutes). . These giant rafts are made for the kid in us all, and therefore can be enjoyed by swimmers ages 12+.